Bug's creepy-crawly insect friends need rescuing from the evil widow Queen Cadavra's clutches. The actual background plot revolves around the title character, Bug, an actor in Hollywood hoping to make his "big break". Players take control shortly after Bug has signed a deal for the lead role in an action film in which his girlfriend is kidnapped by a black widow and must rescue her. The actual gameplay takes place "on the set" of each scene and cutscenes between levels show Bug moving from one set to the next. It is used to determine the future job of the players. Bug! is played like a traditional side-scrolling adventure title. 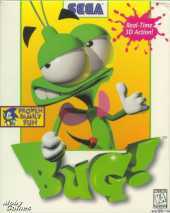 In the same fashion as Sonic, Bug jumped on the heads of his enemies to defeat them while making his way through large levels and collecting power-ups. What sets Bug! apart is the game's 3D levels, which take the side-view and tweak it. Bug can walk sidewise up vertical surfaces and even upside down. Each set of levels (ranging from a bright, green grassy area to a deep red, desert level) have a deeply individual look and feel. Fight your way through six worlds to rescue them and find and defeat the spider queen. There are three levels to get through in each world of 3D platform action. The game also includes some simple puzzle elements. To change the pace of the gameplay every once in a while (in case gamers got tired of the constant jumping strategy), players could pick up two powerups to give Bug new forms of attack. One gave him an electric attack which was best used in close-quarters while another gave him a poisonous spitting attack for ranged combat.